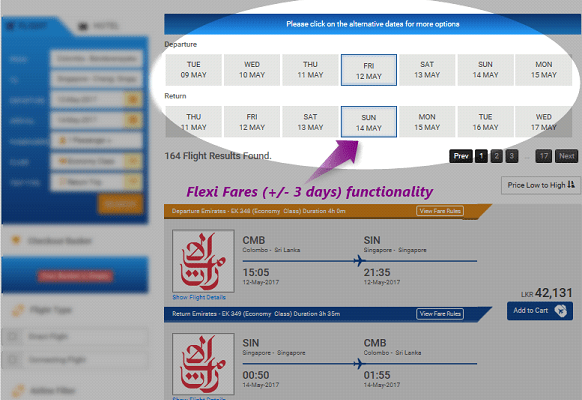 Under this section we will be going through main features and functionalities related to flight booking engine. Features and functionalities listed under this page is only to give an idea of developments we can carry out with in your travel portal. Each of these modules can be customized according to your need. Furthermore, new custom features and functionaries can be developed and incorporated to your flight travel portal based on your organisation unique commercial logic and business structure. Get a Free Flight Booking Engine Quote! We will provide user friendly searching widget to search online flight bookings. B2C users who wants to do online flight reservation can use our travel portal for search availability by entering required searching parameters. Under flight searching widget, system will facilitate user to search flights by using following three options. 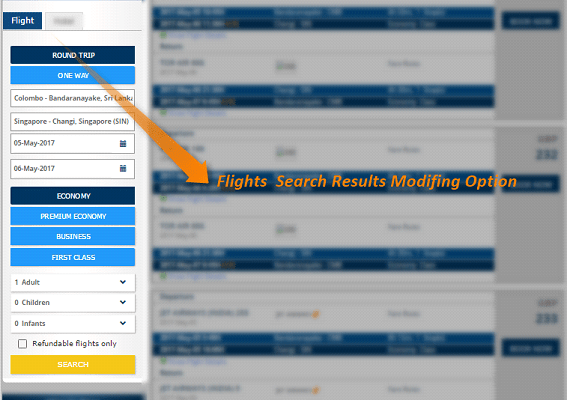 By using this flight searching option, system will facilitate user to search flights for a one way trip. By using this flight searching option, system will facilitate user to search flights for a return trip. 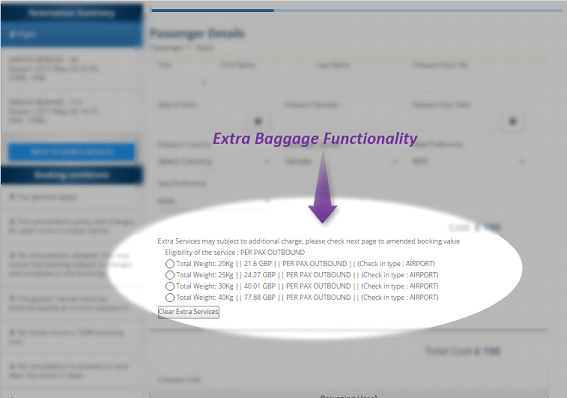 This feature facilitates user to search flights for multi cites as required manner. 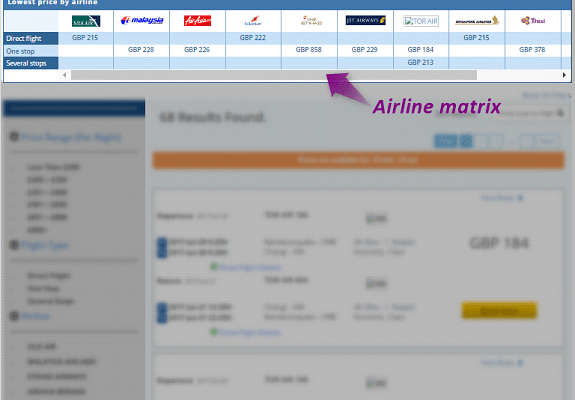 Under availability results page, system will show the search result with all airline list as a grid. The search results will show brief details of each flight and fare. Following mentioned functions and features will be included to availability results page. System will offer a plus or minus 1 to 7 day flexible search option under availability results page. Refer the following figure 2. 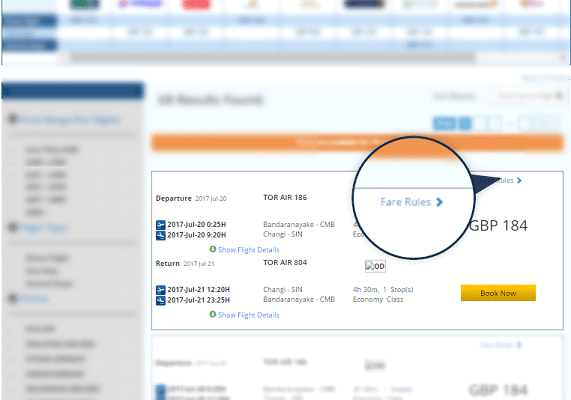 System will facilitate user to check fare rules for each airline under availability results page. Refer the following figure 3. This section will show all airlines in increasing order of the lowest prices under direct, one stop and multiple stop flight categories. 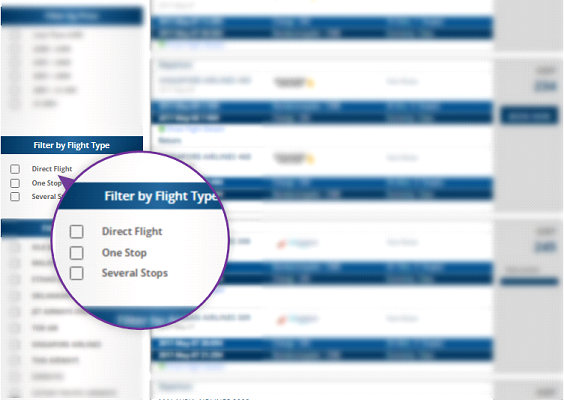 Under flight filters and sorting section we have various options for the clients to narrow down their search results to find best flight seat reservations. Also these filters will help online users to make informed decisions easily. Furthermore having these features will definitely increase flight booking conversations and reduce bounce rate.Each of below modules featured under this section can be customized according to your specific business model. 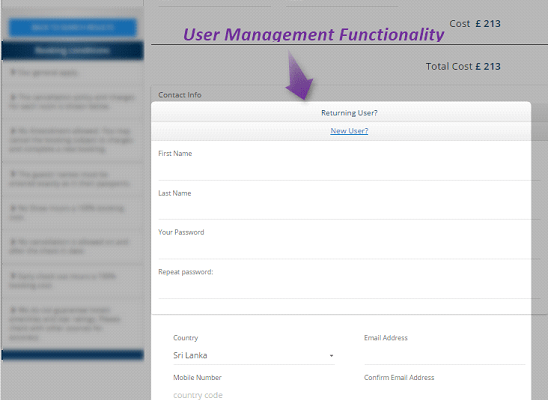 This panel will show search form pre-filled with user criteria. User can modify search criteria and search again. Refer the following figure 5. 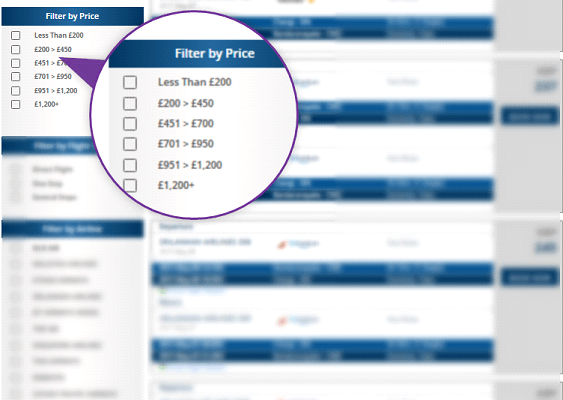 This will provide option to filter search results by price range. This module can be customized according to your need. Refer the figure 6. This will facilitate user to filter search results by direct, one way and multi stop flights. This module can not be customized. Refer the figure 7. 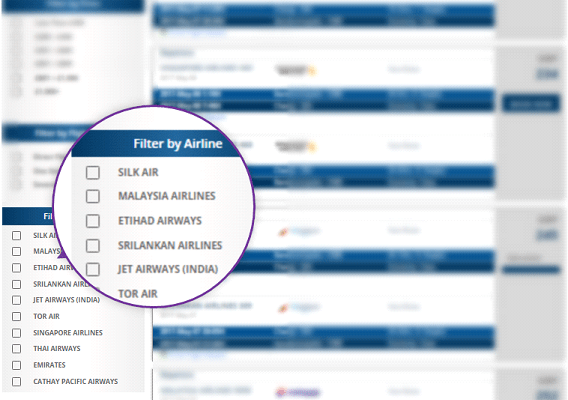 This will facilitate user to filter search results by airline. This is a great filter option when you have preferred to a specific destination. Figure 8. 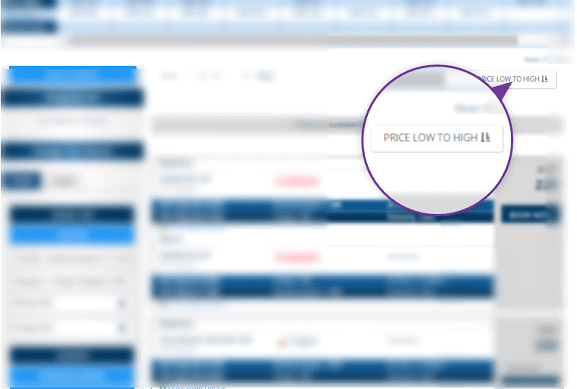 This will provide option to filter search results by price low to high. This module can be used with any other filters. Refer figure 9. B2C users will have an option to continue flight booking as a guest or can create accounts at the time of booking. Refer the following figure 10. 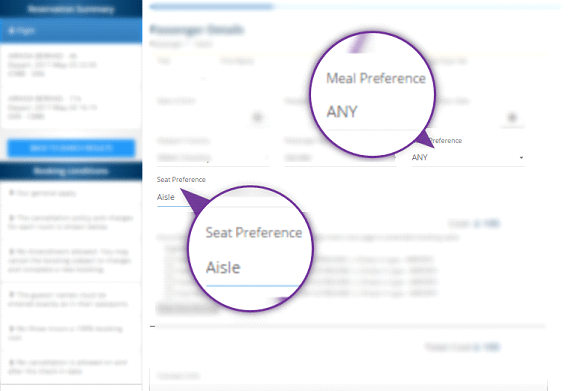 System will allow user to select seat preference (Aisle, Window) along with the flight booking. See Figure 12. With this feature System will offer user to see weather information of selected customers destination city. Our travel portal solution can integrated custom or third party discount code module. Customer can be redeemed these discount codes at the checkout. At the checkout flight booking engine can cross sell other travel related services. I.e Hotels, Transfers, Car Hire, Insurance, Excursions etc..
System will facilitate user to do single passenger cancellation by using this functionality. they will have this feature under user account section. Travel portal system will send auto reminding customized mails to customers for remind their travel dates. System will allow B2C customers to do flight bookings (Java side bookings) and CMS package bookings by using the same account. Our solution is fully flexible to integrate with any online merchant/s or a bank/s. And IPG can be customized with your preferred custom rules. Once client successfully completed the flight booking, system generates mealtime invoices and e tickets and email them to client. Under this section travel system owners can offer subscription facilities to their clients to access VIP flight rates and special offers.